Our design for the hotel was based upon the quirky, eclectic spirit of Nyack mashed up with the overall gestalt of the Time Hotels brand, said Glen Coben, founder and owner of Glen & Co. The Time Nyack opened its doors last night to celebrate their official grand opening. The Time Nyack is the first hotel of its kind in the Hudson Valley, designed by renowned New York City-based architectural and interior design firm, Glen & Company Architecture. The newest development from Time Hotels™ is housed in a former factory located just north of Manhattan in Nyack, New York. 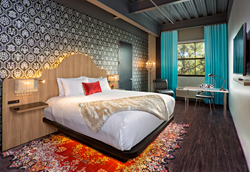 Glen Coben, founder and owner of Glen & Co., collaborated with Architect of Record, Environetics, in designing a hotel that represents the eclectic spirit of Nyack, while reflecting the overall vision of Time Hotels. Developed by WYINC., the boutique development house behind the Pod 39 hotel and The Whitman, in NYC, and managed by Dream Hotel Group, the hotel brand and management company behind Dream Hotels, Time Hotels, The Chatwal and Unscripted Hotels brands - The Time Nyack is a true luxury lifestyle hotel that blends the unique personality and pulse of Nyack with the luxury equivalent of Manhattan hotels. Glen & Co. designed both the public spaces and guestroom suites within the 133-room boutique hotel. Mr. Coben’s concept for The Time Nyack introduces a refined and stylish urban retreat for locals and travelers alike to dine, work and play. Upon entering the hotel, guests are greeted by industrial aesthetics such as exposed brick, concrete and wood flooring and walnut paneling, bringing the Hudson Valley experience into the hotel. Food and beverage offerings will include a modern and vibrant lounge, rooftop bar, speakeasy, and a 150-seat BV’s Grill, an offshoot of the famed Bobby Van’s Steakhouses. Amenities include a business center, outdoor seating with bar and pool deck, fitness center, bike program, free shuttle services, Tesla charging station, and more than 4,000 square feet of event space. The lifestyle-driven boutique hotel features industrial-inspired guest rooms with loft-style interiors. The rooms boast custom-made details and designs including modern furniture, graphic and textured wallcoverings, area rugs inspired by hand-woven Persian carpets and headboards with integrated lighting. Unique touches such as industrial lighting set against feather-adorned sconces are incorporated throughout the space. Nestled on a slope overlooking New York’s Hudson River, Nyack is home to many artists, bohemians, and New York City transplants. Mr. Coben’s innate understanding of architecture and design and his ability to change and adapt styles to each and every project has shaped the narrative of The Time Nyack that will honor Nyack’s cultural, art and culinary offerings as well as its free-spirited community. For more information on The Time Nyack, visit http://www.thetimehotels.com/nyack/default-en.html. Current projects focus on the design, development, and implementation of several value-oriented hotel projects. Coben and his team continue to challenge hotel brand standards, redesigning them to meet the demands of urban locations such as New York City. Recent work includes boutique hotel Archer New York, David Burke fabrick, the James Beard Award-winning Bâtard, Carbone, Empellón Al Pastor, a revamp of Empellón Cocina, and new fine dining restaurant Gabriel Kreuther. Dream Hotel Group is a hotel brand and management company with a rich, 30-year history of managing properties in some of the world's most highly competitive hotel environments. Home to its Dream Hotels, Time Hotels, The Chatwal and Unscripted Hotels brands, Dream Hotel Group encompasses three business lines: Proprietary Brands, Hotel Management and Dining and Nightlife. The Company is committed to the philosophy that forward-thinking design, service and guest experiences should be available across market segments. Dream Hotel Group is dedicated to offering travelers an authentic connection to their chosen destination through a truly original approach. Time Hotels is a nod to Dream Hotel Group's lifestyle roots. As an upper upscale lifestyle brand on the cusp of luxury, it caters to a clientele looking for progressively designed spaces and forward-thinking dining options without a more refined approach. Sidestepping the raucous nightclub scene, its properties feature a more sophisticated lounge feel. Boutique in its ethos regardless of room count, Time offers a more evolved perspective on the lifestyle hotel movement. Beginning with The Time Hotel itself in 1999, the brand now caters to consumers seeking a stylish, relevant option for well-located, well-designed accommodations in gateway locations.